Riverside Way is our brand new luxury student accommodation in Winchester. Situated on Moorside Road, it’s a 10 minute walk to Winchester School of Art and a short bus journey to Winchester University – so it’s an ideal place to live whilst you are studying in Winchester. Being only an extremely short walk into the city centre, Riverside Way offers quick and convenient access to all that Winchester offers. Our modern student accommodation offers a mixture of en-suite rooms with shared kitchens and self contained studios. 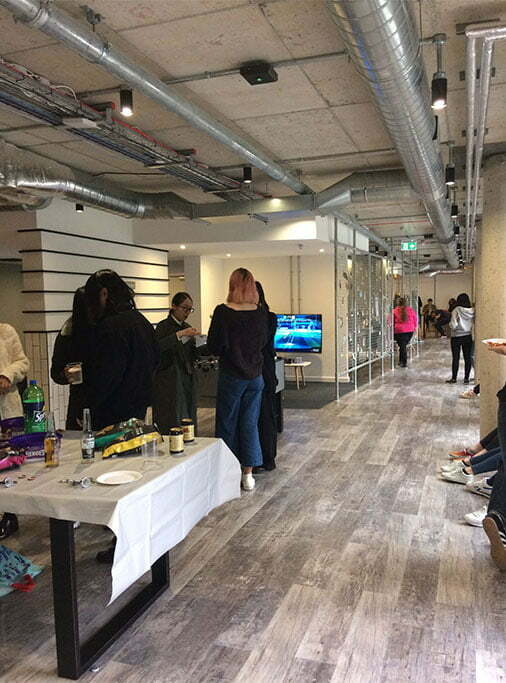 The facilities include high-speed WiFi throughout the building, a group project area for working together with your friends, and a gigantic social lounge. The lounge has vending machines, table tennis, a gaming area and a large screen. Our on-site management team is always at hand to help, and the property is fully secured with CCTV coverage. Riverside Way is a premium development of luxury purpose built student rooms. The property contains superb facilites including a large common room, a group study room, superfast wifi and landscaped gardens. All the rooms are brand new and benefit from modern decor. The Premium En-Suite room consists of a spacious bedroom, with a small double bed, an en-suite bathroom with an overhead shower, a full height wardrobe with mirror, and ample storage space. The bedroom forms part of a flat which has a communal kitchen, which is fitted with a full range of cooking appliances and has individual storage cupboards for each student. All the rooms are brand new and benefit from modern, neutral decor. If you like your own space with your own kitchen, then this is the choice of room for you. The Premium room consists of a spacious bedroom with its own private fully fitted kitchenette including a breakfast bar, an en-suite bathroom with an overhead shower, a small double bed, a full height wardrobe and mirror, and ample storage space. Winchester is a great place for student life. It is an unspoilt cathedral city set on the border of the rolling South Downs. It is a fantastic option for students who enjoy nature and outdoor sport, with a stunning riverside setting. Winchester provides a true taste of English history and is especially wonderful for International students who would like to come and discover the pleasures of living in England. Winchester is an amazing place for students who enjoy cultural events. There is a thriving contemporary arts scene in the area with frequent open air, street theatre events, farmers’ markets and craft fairs. The ever popular Christmas Crafts Market is well-renowned for artisan wares from all over the UK. Students will be able to build fond memories of their time in Winchester, with numerous traditional pubs, cafes and bars all in a charming historic town setting. Winchester is a historic cathedral city. It boasts the Great Hall of Winchester Castle housing the medieval round table linked to King Arthur. World class attractions and architecture. 1 hour train ride from Winchester to London Waterloo. There are excellent motorway links from all parts of the UK to Winchester, with the M3 providing valuable connections direct to London. Winchester is on the main bus route with regular services from Southampton, Oxford, London and Heathrow. Rail options include the main line from Southampton to Waterloo and the Midlands, with an average journey time of London to Winchester by train, being just 55 minutes. Winchester has a brilliant selection of pubs, bars and restaurants with several of the big chains around the city. There are also many independent venues from the weird and wacky pub, The Black Boy, to the late night café at the Cornerhouse. For students that prefer the cultured scene, the Chesil Theatre, Winchester Theatre Royal, Winchester Guildhall and The Railway all host performance arts, comedy, plays and live music events. I can't wait to move to Riverside Way in September 2017..the rooms have lovely modern fittings and the kitchens have all the equipment and lovely views out from large full height windows.